Hello Guys, This post is only dedicated to video song lover. This time we sharing all latest video song from upcoming film Dangal. Every One is excited for this film. The trailer of this film has already released. Trailer is too good, Aamir Khan Khan performance is outstanding. Trailer has received great response from fans. This is the biographical sports drama film directed by Nitesh Tiwari. Aamir Khan is playing a role of wrestling teacher who taught wrestling to his daughters Geeta Phogat and Babita Kumari. He portrayed a character of wrestler Mahavir Singh Phogat. 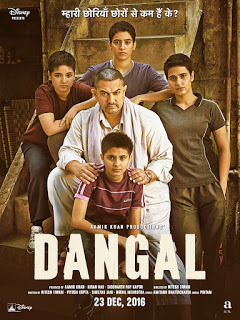 The music for Dangal is composed by Pritam, while lyrics are written by Amitabh Bhattacharya. The first song of this film 'Haanikaarak Bapu' has already released. Dangal is scheduled for release on 23 December 2016. We have already written may post on this topic. You can get all latest video song in HD from one place for any latest Bollywood movies. I hope, you will like my post. This is the first video song of this movie. This is the very special and entertaining song which is sung by Sarwar Khan & Sartaz Khan Barna and lyrics by Amitabh Bhattacharya. This is very special song of Dangal film. The song is sung and rap by Raftaar. If you will hear this song, than you feel pride. This is the another beautiful melody song released. This song is sung by Jonita Gandhi and lyrics by Amitabh Bhattacharya. Dhaakad song is again released in Aamir Khan voice. This is popular song of Dangal movie. After Aati Kya Khandala, Aamir Khan sings a song once again for this movie. This version of the song will not be available in the film, so enjoy it here.